Q. What types of Shows do you have? A. At Mad Science, our Shows can fit any type of event that you are hosting. 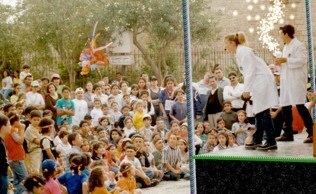 For example, our Shows can take the form of assemblies, corporate events, neighborhood gatherings, etc. A. Between 30 and infinity. We can adjust our Shows to the size, and age group, of your venue. A. On average, our Shows last 50-60 minutes. If you would like to present a Show in conjunction with Mad Science booths, to kick off, or wrap up a science night, we can make the Show 30 minutes. Q. What kind of space is best suited to a Mad Science Show? A. An ideal event location would be an area with an open space for the children to sit on the floor. Mad Science Shows generally work best when held indoors, however, during the summer months, we can make accomodations for an outdoor venue. A. For each scheduled Show, we will require a 6-8 foot long banquet-style table on which to place our equipment on as well as a trash can. Depending on the Show you select, we may need access to an electrical outlet and access to a sink and/or water. Q. Will we require additional staff for clean-up after the Show? A. No, our Shows are mess free! We clean-up after ourselves when we’re finished. The Mad Scientist will need about 30 minutes time for packing and cleaning-up after the Show. Q. How long in advance should I begin to plan for a Mad Science Show? Q. How do I book a Show? A. Please call us at (425)-556-0800 or simply click here. Q. What exactly is a Mad Science Booth? A. Our Booths are a unique and interactive way to have fun with groups of children. Q. Do we have to provide any personnel to run these booths? A. No, each Booth has at least one trained Mad Scientist to assist the children and answer questions. Q. Are these Booths age appropriate? A. Yes, all of our offerings are appropriate for Kindergarten through 6th Grade. A. Anywhere from one hour to however long you would like. Q. Can I have more than one Booth for my event? A. We are pleased to offer 11 different Booths from which to choose. You can have one, or all eleven. Q. Are you able to help us plan our event by mixing Booths and a Mad Science Show? A. Absolutely, you provide us with the number of children attending, your budget, the date, and we can help you make your request a spectacular event. Q. Why should I use Mad Science for my Science Night? A. Quite simply, we offer you a comprehensive package that includes professional museum quality displays, fascinating experiments, a strong interaction between students and Mad Scientists, and highly educational fun! 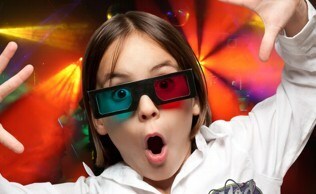 We bring everything necessary to assure you a quality event that will "wow" children and parents alike.